Apple has released updated guidelines for App Store Connect that describe how app developers should use IFA (IDFA). Click here, to read more about these guidelines. Check this box if you show ads in your app. AppsFlyer's SDK is not used to serve ads. This box must be checked because AppsFlyer uses IDFA for install attribution. This box must be checked because AppsFlyer uses IDFA for re-engagement attribution. Check this box. 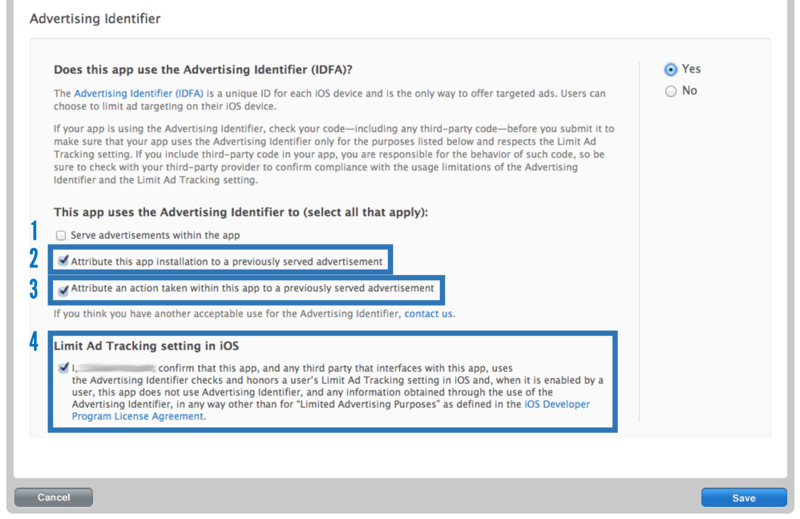 The AppsFlyer SDK collects the iOS Limit Ad Tracking (advertisingTrackingEnabled) flag when collecting IDFA. AppsFlyer uses IDFA only for conversion events, estimating the number of unique users, security and fraud detection. The data is owned by our clients, the app developers, and AppsFlyer never uses IDFA for user profiling and retargeting. Your media partners might have different uses for the IDFA. You must make sure that these partners fully comply with this section.